Pipette.com linear pipette stand and pipette carousel are designed for all major pipette models including Gilson, Rainin and Eppendorf pipettes. These are great and durable economic alternatives to the expensive manufacturer brand pipette stands and carousel stands. Pipette.com pipette stands come in two sizes, 4 single channel pipette and 6 single channel pipette capacity. Pipette carousels and stands are key to keeping an organized lab benchtop and avoiding distracting clutter. 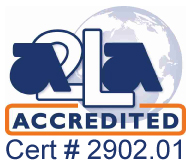 They provide a great platform to manage your pipettes and fit most major pipette models. The pipette carousel rack is also a perfect fit for keeping your bench-top organized. 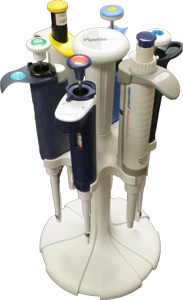 It has a universal fitting for pipettes, is stable, and features slots for 6 single channel pipettors. Keep your pipettes safe and in a convenient location with these great pipette stands. 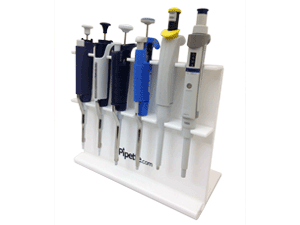 Pipette.com pipette holders come in linear stand or carousel stand models to meet your laboratory benchtop needs. Pipette stands maintain proper alignment of the piston, they also reduce the chance of contamination. Storing your pipettes up on a stand will keep substances on the lab bench and away from your pipettes, gloves, and most importantly sensitive samples. Plus, they reduce the chance of knocking pipettes off the bench saving you replacement or repair costs. To finish, keeping the bench organized is a great way to improve your lab’s efficiency. Spend less time searching your cluttered work space and more time pipetting! If you are looking to keep you pipettes accurate, unbroken, uncontaminated, and organized, invest in a pipette stand! They come in both carousel and linear styles, depending on your preference. One of the easiest, but most effective ways you can maintain your pipettes is to store them vertically. Every moment the pipette is horizontal, gravity is slowly working on the piston, gradually worsening its alignment and compromising your pipette’s calibration. Taking an extra second to hang your pipette on a stand could save you a ton of time, money, and headaches in the future. ***For Gilson Pipetman, please order Catalog # SR-4G or CS-6. Save time and increase efficiency by spending less time looking for your pipette. Please! Use a Pipette Stand!